Product prices and availability are accurate as of 2019-04-21 03:46:58 UTC and are subject to change. Any price and availability information displayed on http://www.amazon.com/ at the time of purchase will apply to the purchase of this product. The perfect split turkey boa economical yet looks beautifully elegant. 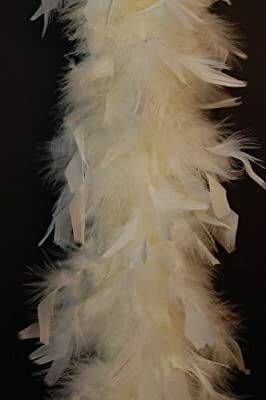 This boa looks great around the shoulder or used as a trimming for evening wear, prom dresses, costumes, hat pieces and theatrical events. We only use the best quality feathers, hand sewn and perfectly dyed to vibrant colors. Each boa comes in a 2 yard length (6 Feet) and is apprx 7-9" in diameter (very wide from top to bottom). Each Boa weighs 80 Grams. All of our feather items have been professionally cleaned, steamed and sanitized to perfection. They have been hand selected for best quality.